Who Will Northern Ireland Become? This is Giant’s Causeway, miles of hexagon-shaped volcanic rock jutting from Northern Ireland far into the Atlantic. Nature’s roughly 60-million-year-old seascape still inspires legends of a proud local giant who tossed chunks of coastline in the water to cross and confront a Scottish aggressor. It’s also a World Heritage Site with robust human foot traffic. 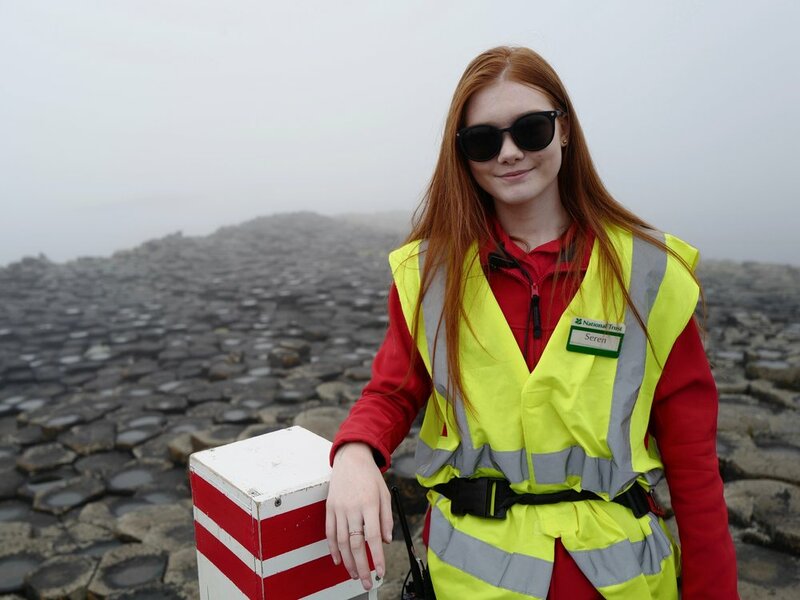 Wearing the signature vest of Northern Ireland’s National Trust, eighteen-year-old Seren Pemwick moves through the fog, politely but firmly redirecting visitors from treading on protected areas. When she isn’t working as a preservationist, Seren is in school nearby, and admittedly quite anxious to see more of the globe. If she follows her instincts, she'll join the surge of local teens to thirty-somethings emigrating for a better life. Brain drains commonly afflict post-conflict countries, but in Northern Ireland’s case, it’s an accelerating departure of promising youth. An exodus the government calls permanent, it is deeply troubling here, where an embattled history of bloody, sectarian attachment to the land has been part of the national psyche, generation after generation. Perhaps until now, say demographers. Because unlike the Republic of Ireland, where the 1980s epic youth flight boomeranged and the majority came home, those leaving this part of the island just aren’t turning around. This week’s fresh data shows business in steep decline, pushing even more jobseekers to look for opportunity elsewhere. Why now? Northern Ireland, part of the United Kingdom along with Great Britain (England, Wales and Scotland), is a hot spot in the vexing Brexit debate. The UK’s ambiguous departure from the European Union has spread confusion, fear, and powerlessness. Despite the greatest numbers of Northern Irish strongly opposed to Brexit, they will be forced to comply. Threats of a hard border between the Republic of Ireland and Northern Ireland and severed access to the EU’s labor markets cut deep into confidence. It’s even driving out Eastern European immigrants, a sort of replacement workforce compensating for the native youth flight. Official government stats convey good news/bad news for those who remain: youth unemployment is down 1.4 percent since this time last year, but much of the decrease is due to the increased number of “economically inactive” youth, that is, people have simply given up. Most profoundly, what the Irish Times once called “the three pillars of Irish society, priests, politics and police” are losing their footing. Witness the trend among 18 to 34-year-olds who view clergy, elected leaders, and public safety with suspicion. Despite their church-based rearing, they seek minimal religious engagement and tell pollsters and the media they don’t want their parents’ baggage: widespread post-conflict trauma, simply incalculable in a place where it’s taboo to discuss emotional struggles. Indeed, Northern Irish suffer the highest recorded incidence of mental illness among UK citizens, yet they receive dangerously low public funding. Locals fear any greater instability could again slide into sectarian violence that seized the region for three decades. Twenty-one years after the Good Friday accords, the Catholic-Protestant divide is inescapable. War memorials, some large and complex, dot every city, town, and hamlet. Huge billboards show graphic images of beatings, crowds caught in tear gas, fallen martyrs. In many monochromatic low-income housing blocks, striking outdoor murals provide the only vivid color. The messaging from graffiti to 3-D displays appears at bus stops, on sports fields, along fences: you belong with your people. Vicious paramilitaries—homegrown variations of both Republicans (Catholics) and Loyalists (Protestants)—target the vulnerable; their criminal gangs deal drugs, extort victims, and traffic humans. How does all this play with those entering adulthood? Mental illness saddles half of Northern Irish youth—two thirds feel overwhelmingly stressed and a third feel helpless. Belfast’s progressive cultural hub, the MAC, pinpoints social phenomena that desperately need public spotlight and problem solving. Last year it opened a yearlong artistic window into mental health, with a far reach into Northern Irish schools and communities. The dialogue is opening, and includes Brexiles, of course. Need to beef up your Brexit-speak? Here’s a quick lexicon cheatsheet. For a close look at legal, tax, and trade terms, click here. Want to dive deeper? Help the Samaritans, a national suicide hotline scrambling to meet ever-growing mental health needs. Bolster the Northern Ireland Youth Forum, which gives youth a voice in local and national government. Explore Northern Ireland’s wide array of local solutions to conflict challenges in PeaceInsight, a striking international database.